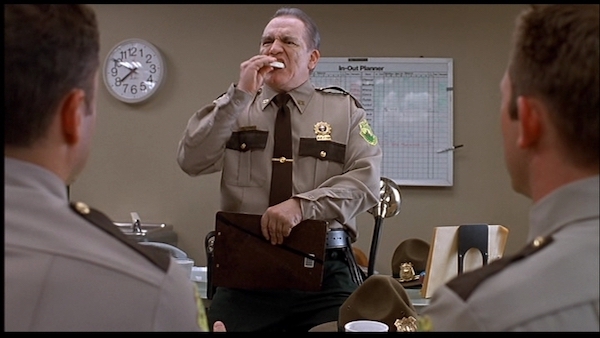 Released 17 years ago in 2001, Broken Lizard's second feature (after their lesser known debut Puddle Cruiser) put them on the map and quickly made them everyone's favorite loveably dumb cops with their silly antics. Due to the film's strong word-of-mouth, it quickly climbed to cult status and has since become a staple of the stoner comedy genre. The film's fun and games even found its way into the realm of professional hockey when Ray Kaunisto of the Kalamazoo Wings snuck in seven meows during a 40-second intermission interview, which is impressive even by Super Troopers standards. In gearing up for the upcoming release of Super Troopers 2, we wanted to show our love and admiration for the original by sharing a few fun facts about the comedy, which, bonus fact, was birthed from Jay Chandrasekhar getting pulled over for speeding and turning into a big wimp. 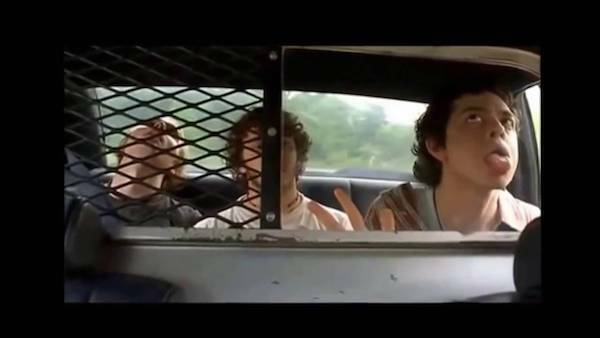 Listen closely meow, we're serving up some lesser known fun facts about Super Troopers! Kevin Heffernan's parents wanted to be in their son's movie, and Heffernan agreed to give them a part, but didn't tell them squat about the scene. 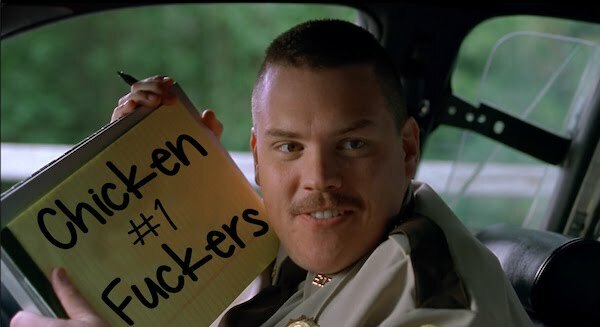 His parents ended up playing the role of the couple who Farva (Heffernan) pulls over and calls "chicken fuckers". Heffernan's parents figured Kevin would say something rude, but they weren't prepared for the line they received, which means their reactions are 100% natural. Jay Chandrasekhar also includes a nod to his father in the film, as his character, Arcot Ramathorn, share the same first name. The bullet-proof cup had a bigger audience. Menthol was used to achieve the redness in the troopers eyes during the scene where they're smoking and watching the Johnny Chimpo cartoon. The makeup artist blew menthol into their face, and, voilà!, instant stoner redness. This wasn't the only use of menthol on set, either. The scene in which Rabbit (Erik Stolhanske) is stuffed into a locker and covered in shaving cream was menthol shaving cream. Everyone on the crew was unaware that menthol can burn your skin when left on too long, but Stolhanske quickly figured it out for himself. Soon after the scene, Stolhanske ran next door to a firehouse and was promptly hosed off. The bar of soap that Brian Cox (O'Hagan in the film) bites into was made out of white chocolate. Cox, who happens to be a diabetic, got mad after biting into the bar, finding out that it wasn't sugar free. The crew then had to scramble to find a sugar free version so Cox could finish the scene.